In the previous post, we’ve shown you why the Italian north should be on your bucket list and now we’d love to share the secrets about why Southern Italy is no less worth a visit as well. To get a better understanding of what you actually want, let’s get a deeper insight into the peculiarities of Italy’s southern side so you to decide what Italian corner suits you best. It is to be emphasized that to really get to know the country, you need to come to Italy more than once, and even at different seasons of the year. Basically, tourists go to Northern Italy to see the famous sights, while the south of the country is mainly chosen in order to get acquainted with the true spirit of Italy. Cities of the south seem as to have been created for endless holiday and, of course, for carefree relaxation on one of the many magnificent beach resorts, that the region provides in abundance. In this post we want to introduce you to the dazzling southern part of Italy and also like to present some ways of how you can diversify your Italian vacation by mixing the north, described in Northern Italy vs Southern Italy | Part in which we compared Northern Italy and Southern Italy differences, with particular places mentioned in the current Southern Italy review below. The sun-kissed Italian south experiences the influence of Spain and Greece so the vibe of the region may seem more warm and hospitable. Southern Italy reflects the soul of the country at its most ancient and heartfelt way. This area is more about cozy seaside towns, lovely beaches and exceptional food experiences. To get a better understanding of what Italian south feels like, here are top-five Southern Italy must-visits that will expose you the other side of the country with golden beaches, mysterious caves and amazing people that make you feel like you’re at home. We suggest starting your Southern Italian discovery form the most picturesque and exotic regions of Italy, amazing Campania. This place combines extraterrestrial reliefs with green hills and majestic volcanoes, and the mild Mediterranean climate turns these lands into a true paradise. Naples is the city of contrasts that always pleases the eyes with various ancient masterpieces like the Royal Palace of Naples and Castel Nuovo as well as modern art locations. The region also provides a chance to explore a unique archaeological site, Pompeii, once destroyed by the violent eruption of Vesuvius. Moreover, Campania is considered to be the motherland of pizza so only this fact alone is enough to include it into your itinerary, right? Another magical destination where multiple colors and flavors are intertwined in a beautiful mixture is the Amalfi Coast. This striking location has a range of appetizing offers. If you dream of spending a nice holiday basking under the gentle Italian sun, Amalfi will meet all of your demands and even more. 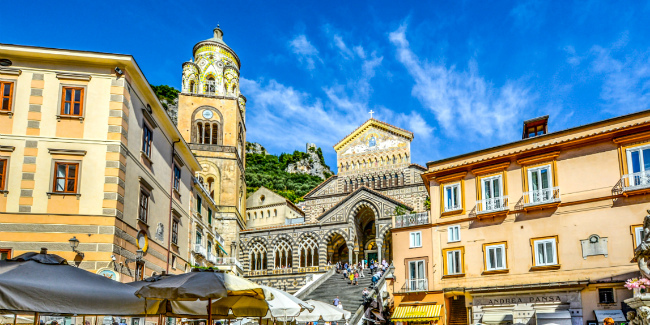 The place possesses a plethora of charming cities like Positano, Sorrento, Salerno and Ravello, that allure travelers in a way that once you visit them, you will desire to stay forever. Not to mention a number of natural wonders and exclusive stunning scenery which make the Amalfi Coast a top destination even for Hollywood celebrities. Puglia attracts tourists from all over the world with its fairytale towns and the longest and prettiest coastline in Italy. Historically, this part of modern Italy was under the Greek rule for quite a long period of time, so the principle of building cities and villages is very similar to the Greek ones with their toy trees, white and blue houses and vast olive groves and vineyards. Set on the coast of the Adriatic Sea, the main city of Puglia, Bari, boasts its mazelike old town with numerous medieval structures like Basilica di San Nicola and Bari Cathedral. But a true gem of Puglia is a tiny town of Alberobello famous for its whitewashed stone huts that gain more and more popularity among tourists. If you feel the hunger to see even more ancient structures, take a ride to the closeby town of Matera, located in the neighbor region of Basilicata and boasting some gorgeous cave dwellings. Sicily is a true tidbit that abounds in picturesque valleys, golden beaches, dormant volcanoes and lush green hills. Being the largest island in the Mediterranean, this part of Italy is the land of contrasts. Perhaps there is no other place in Europe where such a harmonious mixture of history and multinational culture can be found. Travel around Sicily offers lots of appetizing opportunities you may have never expected. Apart from visiting fascinating Palermo and Catania and basking in the sun, how about witnessing a periodically awakening volcano Etna, exploring Archimede's homeland in Syracuse, and discovering the largest Doric temple in history, the Temple of Zeus in Agrigento. Pretty tempting, don’t you think? Thу picturesque island of Sardinia beckons lots of tourists with its stunning coastline, beautiful bays, deserted white beaches and a surreal palette of all shades of the blue sea. But Sardinia is not only beaches and the sea. The culture and traditions add charm to this island and make it attractive all year round. Just think about it: 7 different civilizations left their mark on the architecture of Cagliari, the capital of the island, so the Roman amphitheater and the Gothic and Baroque Cathedral harmoniously find themselves on the territory on the city. In general, a holiday in Sardinia is a unique experience as it’s a magical blend of amazing culture, magnificent beaches and picturesque landscapes that will simply make you fall in love. To sum up, it’s true that both parts of Italy represent different and even polar sides of the same coin, having their unique traditions and lifestyle, rhythm and vision of things. However, it’s impossible to get the complete picture of the county exploring only one side as both the north and the south are of great touristic interest. Anyway, it’s impossible to see the country during one trip. But don’t worry, we’ll help to combine destinations of your choice in any sequence and make an Italian itinerary to your taste. So the last word is on you. What gems of gorgeous Italian lands would you choose?